In the crowded firearms marketplace folks are always wondering why the should buy brand “X” over brand “Y”. Armalite has decided on a regular basis to spell out 101 reasons why you should choose them over the competition. Next installment will complete the list. For now go here and see 90 reasons why you should buy an Armalite. Armalite’s AR-10 lower receivers are forged 7175-T73 aluminum, not weaker billet aluminum. All ArmaLite rifles are made in America. ArmaLite is owned by a veteran, not a conglomerate. All ArmaLite rifles come standard with M4 feed ramps. The ArmaLite AR-10 SuperSASS™ has an adjustable gas system that accommodates suppressed and unsuppressed fire. The ArmaLite SPR Mod 1’s forged, one-piece upper receiver/rail system comes with exclusive detachable side and bottom rails. The ArmaLite AR-24 pistol’s slide, frame and barrel are fully machined from ordnance steel forging to provide the strongest and best possible slide to frame fit on the market. The AR-30’s™ octagonal receiver and V-block bedding eliminate movement of the action. Armalite invented the ultra reliable 8” mid-length gas system. Armalite’s AR-10 upper receivers are forged 7175-T74 aluminum, not weaker billet aluminum. ArmaLite’s SPR Mod 1 has the most innovative continuous optics platform in the industry with multiple rail options as standard equipment. ArmaLite’s armorer’s courses for customers. All ArmaLite receiver extension tubes are mil-spec. ArmaLite rifles come standard with forward assist. ArmaLite’s stainless barrels are triple lapped. ArmaLite’s bipod adapter and swing swivel come installed on (T) models. ArmaLite’s bolt carriers are chrome lined on the inside. ArmaLite’s Free Stuff Friday on Twitter. ArmaLite rifles come with two stage triggers as standard equipment. The Army Marksmanship Unit helped develop and test ArmaLite’s AR-10 National Match rifle. ArmaLite’s High Capacity A2 buttstock has more storage room than GI buttstocks. Armalite’s M-15 upper receivers are forged 7075-T6 aluminum, not weaker billet aluminum. ArmaLite’s AR-50A1™ muzzle break is the most effective and MOST COPIED. ArmaLite’s Law Enforcement Carbines combine A2 and A4 sighting options for flexibility. ArmaLite is a manufacturer, not an assembler. All ArmaLite rifles and complete uppers are test fired before shipping. ArmaLite’s president can actually SHOOT. Armalite’s M-15 lower receivers are forged 7075-T6 aluminum, not weaker billet aluminum. The ArmaLite AR-50A1’s™ accuracy is 7-8 inches at 1,000 yards. ArmaLite’s stainless steel barrels are button cut. ArmaLite’s web site library includes the most comprehensive technical notes in the industry. The ArmaLite AR-30™ comes in .338 Lapua. The ArmaLite AR-30™ comes in .300 Win Mag. The ArmaLite AR-30™ comes in .308 Winchester. ArmaLite’s AR-10 SuperSASS™ comes standard with a fully adjustable sniper stock. ArmaLite’s AR-10(T) Carbine is perfect for hunting hogs and big game. All four models of ArmaLite’s AR-24™ Pistol are available in AWB Configuration. ArmaLite’s AR-10(T) ™ comes in 7.62MM NATO. ArmaLite’s AR-10(T) ™ comes in .338 Federal. ArmaLite’s AR-10(T) ™ comes in .260 Remington. ArmaLite’s AR-10® in .243 Winchester has an MOA of 1-1.5. The ArmaLite AR-30™ weighs 12 powerful pounds. Page 24 of ArmaLite’s 2011 catalog features an exploded view of an M-15 complete lower assembly with each part clearly labeled. ArmaLite’s factory boasts a 50 yard indoor firing range for test firing our rifles and complete uppers. The ArmaLite M-15 comes in a 7.62 X 39 version that gives you heavy bullet advantages in a compact package. ArmaLite has its own Facebook page. ArmaLite receivers are made of aircraft grade forgings instead of aluminum slabs. Armalite’s patented Balanced Bolt ™ shifts firing loads more evenly over the bolt lugs. ArmaLite’s AR-10’s have phosphated steel bolt carriers per military spec. ArmaLite’s AR-24™ Combat Custom pistols have a single/double action trigger. ArmaLite has its own You Tube channel featuring videos of our firearms in action. Armalite Tech Note 54 compares the merits of internal and external piston drive systems. ArmaLite’s AR-30™ has an accuracy of 1 MOA. ArmaLite’s M-15(T)™ comes standard with a 20” triple lapped stainless steel Match barrel. ArmaLite’s AR-50A1™ comes standard with a package of Tylenol™ in case you forget your ear plugs. ArmaLite’s AR-10® steel barrel chambers and bores are chrome lined per Mil-C-23422D. ArmaLite’s M-15A4 SPR® (Special Purpose Rifle) accepts detachable front and rear sights, carry handle or a host of scope mounts or devices conforming to the MIL STD 1913 rail. ArmaLite’s M-15™ Carbine is available in alternate caliber 6.8 II for shooters who prefer bullets heavier than 5.56MM. The ArmaLite AR-50A1’s™ aluminum stock reinforces the receiver like a bench-rest sleeve. With the ArmaLite-invented mid-length gas system, gas pressure is lower when the gun starts to unlock, so extraction is easier. ArmaLite’s AR-10(T) in .260 Remington has an accuracy of 1 MOA. ArmaLite’s AR-10(T) in .338 Federal has an accuracy of 1 MOA. ArmaLite’s AR-10(T) in 7.62MM NATO has an accuracy of 1 MOA. 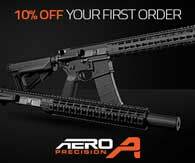 ArmaLite’s AR-10 SuperSASS™ has an accuracy of 1 MOA. Page 18 of ArmaLite’s 2011 catalog features an exploded view of an AR-10 complete lower assembly with each part clearly labeled. Armalite’s steel barrels come double lapped standard, not as an extra. ArmaLite’s SuperSASS has a quad railed free float handguard. The M-15 A4 Carbine in 6.8 SPC II has an MOA of 1.5-2. ArmaLite Tech Note 72 offers recommendations on cleaners, lubricants and preservatives for your firearm. Our M15A4 Gunsmith Kit includes the complete upper and lower receiver with all internal parts. Page 1 of our 2011 catalogue includes bullet weight recommendations for all of our rifles. GI receiver extension tubes are standard, not an extra. The AR-10(T) .260 Remington has a 22” triple lapped stainless steel match barrel. The much coveted ArmaLite Toaster often comes free with a rifle purchase. The ArmaLite AR-50A1 weighs 33.2 pounds. Our M-15 Law Enforcement Carbine weighs 6.5 pounds. Page 15 of ArmaLite’s 2011 catalog features an exploded view of an AR-10 upper receiver with each part clearly labeled. The AR-50A1 includes a spring loaded automatic ejector. We provide phosphate steel parts per MIL-STD-171 at no extra charge. The ArmaLite AR-10 National Match has a 1 MOA. The ArmaLite M-15 National Match has a 1 MOA. ArmaLite Tech Note 87 offers advice on the proper care of your ammunition. Our AR-10(T) .260 Remington has a RH 1:8” twist. Our M-15 -7.62X39 Carbine has a 16” barrel with double lapped Chrome Moly Vanadium Steel with a chrome lined bore and chamber and M203 step-down. Say THAT 3 times fast!